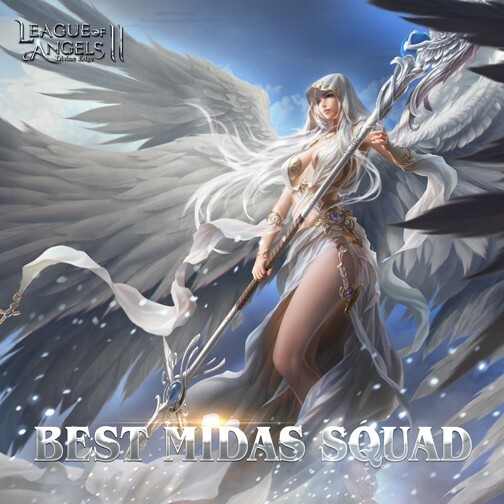 Last week, some players gave brilliant reports about the "Best Midas Squad" in theri opinions. Check out these fans strategies to strenghthen your squad! Odin is your softener, his targets are Aurora's and your mains kills. The first round of Ultimate Odin hits a column, then Aurora hits those same two targets then your main uses clothing skill to target lowest %health enemy for the kill. This process is repeated every round of Ultimate skills. Standard setup to force fast skills on healer (Flora) and support (Athena). I added the main to the front line, but I'd suggest putting him front bottom. Top front takes the most damage, so that's where I'd place Athena. With her shield, you will get a benefit that lasts well past her death thus making her relatively more expendable. The idea is to deal crippling damage with the first set of ultimates. You will get the benefit of Athena's buff and then following into Aphrodite's ultimate. Have Aurora go right after Aphro to act as a finisher. All 3 front liners have the ability to tank. Additionally, you will notice this setup counters most focus lineups as my main sources of damage(Lydia and Aphrodite) are positioned in separate rows and columns. This means that no column or row focused line up can take out both my main damage. The heroes in this setup are backline focused killers, which is great because most other kingdom formations either put their main damage or healers in the back. We can take them out quickly and then deal with the remainder of their heroes.